The Japanese government has issued a warning to its citizens after North Korea fired a missile over the country. 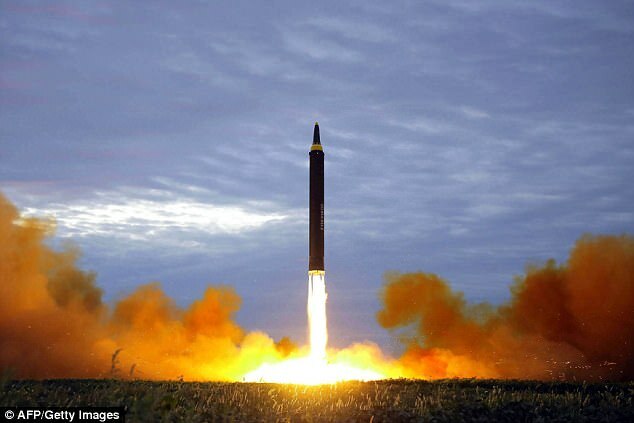 It was launched from the Sunan district of Pyongyang, South Korea's military said. The missile flew over Japan, NHK television said, and the government is warning citizens to avoid touching anything that looks like debris. 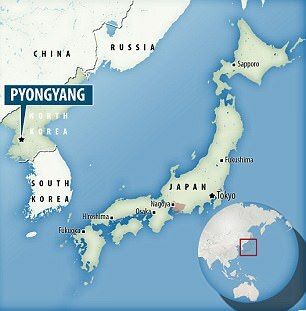 'Japan can never tolerate this repeated provocative action by North Korea,' Tokyo's government spokesman told reporters. It landed 1,240 miles off the cape of Erimo in Hokkaido island at about 7.06am local time. South Korea's defence ministry said it probably travelled around 2,300 miles and reached a maximum altitude of 478 miles after being launched near Pyongyang's airport. The North previously launched a ballistic missile from Sunan on August 29, which flew over Japan's Hokkaido island and landed in the Pacific. The South Korean and US militaries are analysing details of the launch, the South's Office of the Joint Chiefs of Staff said. South Korea's presidential Blue House has called an urgent National Security Council meeting. Japanese chief cabinet secretary Yoshihide Suga said there is no evidence yet of any missile fragments landed on Japanese territory. It comes as North Korea threatened to nuke Japan and reduce the US 'to ashes and darkness' in response to the latest sanctions imposed by the UN. The UN Security Council imposed its eighth round of sanctions on the country over its banned missile and nuclear programmes. The North Korean threat was issued via the North's state news agency as US defence officials said the regime has spent the last 48 hours moving mobile missile launchers and preparing fixed sites for launch. 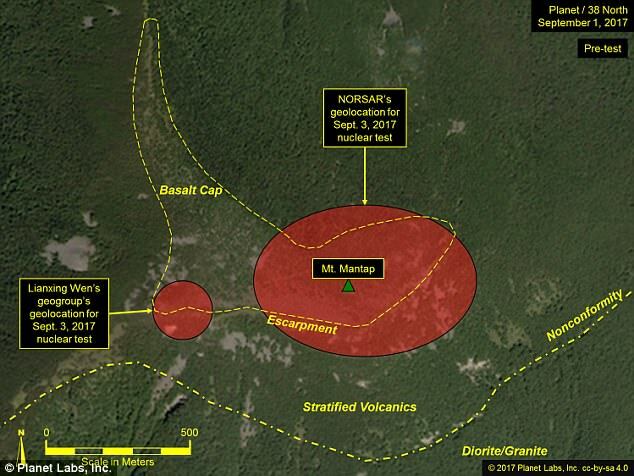 Elsewhere analysts from Johns Hopkins University said Kim Jong-un's regime appears to be readying its nuclear test site for more detonations following the explosion of what North Korea claims was a hydrogen bomb on September 3. 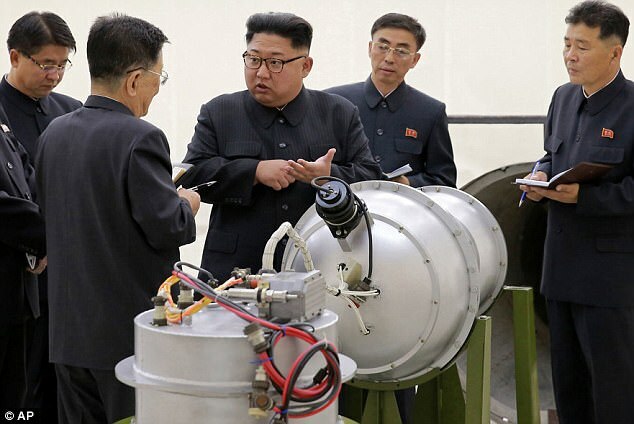 Analysts believed that North Korea's latest missile, the Hwasong-14 is capable of ranging most of the mainland US, and has already been fired over Japan. In a statement released by news agency KCNA, a spokesman for the regime said: 'The army and people of the DPRK are unanimously demanding that the Yankees, chief culprit in cooking up the 'sanctions resolution', be beaten to death as a stick is fit for a rabid dog. 'There's limit to patience. Now is the time to annihilate the U.S. imperialist aggressors. Let's reduce the U.S. mainland into ashes and darkness. 'Let's vent our spite with mobilization of all retaliation means which have been prepared till now. These are voices of the Korean army and people. 'Also heard in the DPRK are strong accusations against the Japs who have zealously joined in the US racket for sanctions. 'A telling blow should be dealt to them who have not yet come to senses after the launch of our ICBM over the Japanese archipelago. Seoul's military carried out a ballistic missile drill of its own yesterday in the East Sea, Korea's name for the Sea of Japan, the Yonhap news agency reported. In July, Pyongyang fired two intercontinental ballistic missiles that appeared to bring much of the US mainland into range. It followed that up with an announcement it was planning to send a salvo of rockets towards the US Pacific territory of Guam, home to significant military facilities. US President Donald Trump threatened it with 'fire and fury', heightening fears of conflict. The United Nations Security Council sanctions imposed on Monday are the strongest so far, banning the North's textile trade and imposing restrictions on shipments of oil products, among a series of other measures.